Elephant, the biggest land animal and the traditionally tamed animal of India, is the official animal of Kerala. They are held in high esteem and are treated with awe in Kerala. 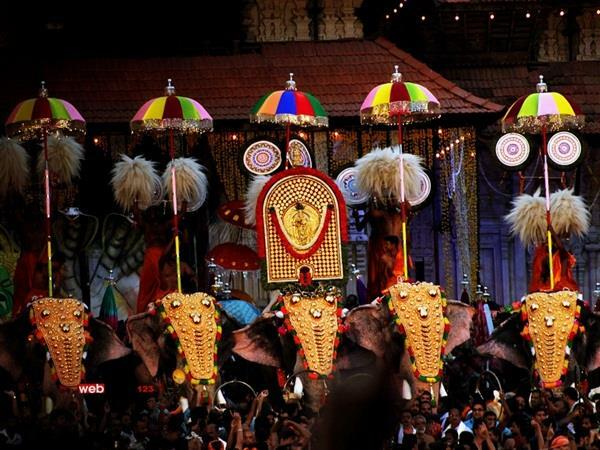 A spectacular array of majestic elephants taking part in Thrissur Pooram, an annual Hindu temple festival celebrated in Kerala. Elephants play an important part in Kerala culture too. They form part and parcel of the rituals associated with the temple festivals of Kerala. They carry the Gods idol and are decked up in glittering attire during the festivals, which is an awesome spectacle. 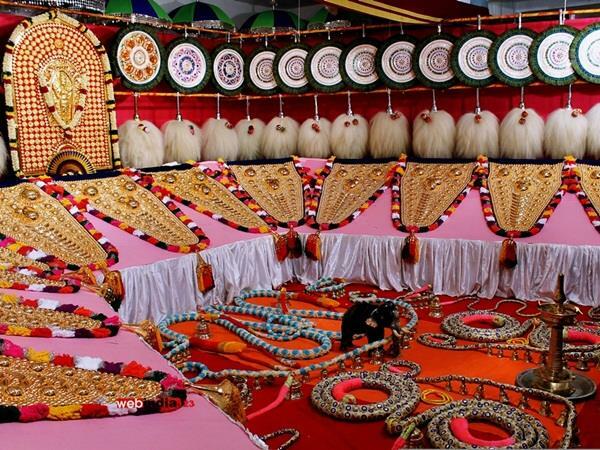 The exhibition of elephant ornaments and decorations locally known as Chamayakazcha, held during temple festivals. There are 3 genres of elephants : Male elephants, Female elephants and Makhanas. Male elephants are called Komban Aana, Female elephants, Pidi Aana and the Makhanas, male elephants without tusks, are called Mozha in Kerala. unique. It has to be experienced to understand. They love elephants as their children and take care of them, exercise, and feed them as their own. The chaining process is just a heritage system followed since 100 of years. But some mahouts are so close to their wards that they can handle them even without any chain. Most of the male elephants have musth period during rainy season (monsoon season) from June to October. The musth period, on an average, lasts 3 to 4 months for an elephant. Musth is a periodic condition of elephants characterized by highly aggressive behavior, accompanied by a large rise in reproductive hormones. Before the period of musth, is the time, when elephants need special care. The treatment named ‘sukhachikilsa’ in Malayalam, is usually done in April, May and June months. During that period, the daily routine of elephants undergo lot of changes. Early morning is the time to take a walk for good fitness; after that mahouts give them water and flattened rice (aval) mixed with dates, about 5 to 6 kg. Then it’s time for a bath. Mahouts work hard for a few hours to cleanse them. At times the wash takes almost 4 hours. After the wash, mahouts feed the hungry elephants, rice mixed with variety of medicines to keep them healthy and fit. Different elephants need different medicines, as suggested by a good veterinary surgeon or a traditional doctor. Some of the common medications are chavanaprashyam, ashtachoornam and vitamin tablets, which help enhance their growth. Almost 7kg of rice is needed for one elephant. After that, mahouts give them palm leaves or coconut leaves to eat. Then again they are walked through the village paths. Elephants in the wild could never get such good treatment, care and food.